When someone you know goes on vacation in Curaçao, you expect to get a nice souvenir. But a real headache begins when the roles get switched, and you go on vacation in Curaçao. Imagine you are relaxing in your beach chair while you are drinking a blue colored cocktail, and the sun feels nice on your skin. At that moment, you realize that in a few days you will be going back home. You haven't purchased any souvenirs yet, and you have no idea what to get your friends and family back home!! Worry no more, we made a list for you with the top Curaçao souvenirs. Of course, all available at our Gift Store. Tip: the best souvenirs are the ones that have a story and are truly made in Curaçao. The ones who receive it will feel special as you put in the effort to find them something. There are many Curaçao orange liqueurs that use the name Curaçao, but you want the one that is actually made in Curaçao and with the authentic ingredients. How do you know which one is made in Curaçao? Simple, look for the one that has "the Genuine Curaçao liqueur" on it, produced by Senior & Co. This is the only Curaçao Liqueur that is allowed to use the word genuine as they use the peels of the Laraha orange, only found in Curaçao! 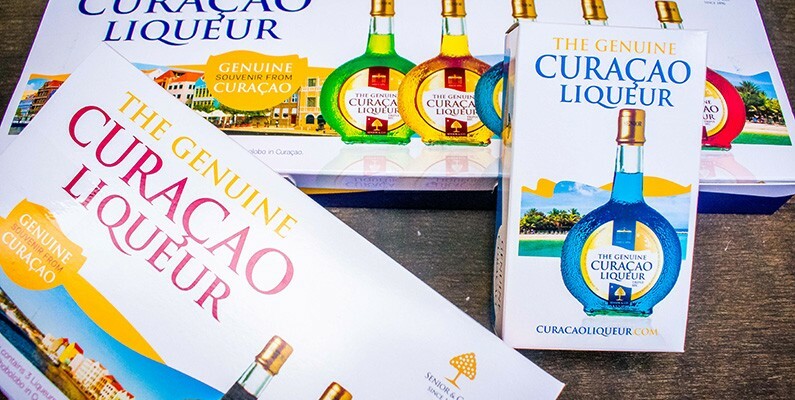 The 5 small bottles in the Curaçao Liqueur pack are perfect gifts as many people take the small bottles out of the box and divide them among their friends and family. So it’s actually 5 gifts in one go! This hand-sculptured and painted figure comes in different sizes and has become a popular souvenir. Chichi means the oldest sister in Papiamentu. The Chichi represents a vibrant, dynamic and responsible older sister. The Chichi of the family is also known for keeping the family bond strong and everlasting. The Chichi’s are made in Serena’s art factory on the Eastern side of Curacao. You can even visit them and follow one of their workshops. The Chichi is relatively more expensive, so a perfect gift for those special people in your life. Ask anywhere in the world if someone knows the island of Curaçao and often they often have no idea. Ask them if they know the drink ‘Blue Curaçao’ and almost everyone will know it. Blue Curaçao is a triple sec orange liqueur. The original color of this liqueur is actually clear. Food coloring is added to create the Blue Curaçao. There are not many known facts about the origin of the Blue Curaçao. We assume it is because of the crystal clear blue waters and deep blue skies found in the Caribbean island paradise. As Blue Curaçao is officially a Curaçao Liqueur, make sure you purchase the genuine one by Senior. There are hundreds of cocktail recipes you can find online. The buildings on the Handelskade are probably the most photographed in the Caribbean. One of the most iconic buildings on this street is the Penha House. The Penha House was built in 1708 and based on the Dutch Caribbean colonial architecture style. It is one of Punda's oldest buildings. You can recognize the Dutch building because of the tall buildings, the tight grid of the streets and narrow lots. Fun fact is that the building material is primitive; the builders stacked chunks of coral and glued them together using muddy sand. The ceramic Penha house is a nice way to show the cultural history, which makes Curaçao so unique. This particular ceramic Penha house is a bit different as it has Senior’s Genuine Curaçao liqueur in it. Curaçao can have months of draught, which makes it difficult for plants to grow. One plant, the Aloe Vera, has no problem with that and loves the Curaçao soil and climate. You can even hang an Aloe Vera on the wall and it stays alive up to 5 years! But what makes the Aloe Vera plant truly special is that it is a medicinal plant and used to treat and protect the skin. The reason why it is beneficial for the skin is because of the many vitamins it contains. The plant contains vitamins A, C, E, B1, B2, B3, B6, B12. Some people even eat a small piece daily to improve their health. CurAloe is the largest manufacturer in Curaçao and has a large Aloe Vera plantation. The plantation is also on the Eastern side of Curaçao, quite close to the Serena Art Factory. They produce different skin care lines for facial, body, shower and health. The reason why Aloe Vera products are such good souvenirs is they are part of someone's daily skincare routine. Also, Aloe Vera can be pretty expensive back home so it makes for a pretty cheap valuable gift. We hope that our list helps you find the perfect Curaçao souvenirs. Let us know how your friends and family reacted. Probably only big smiles!